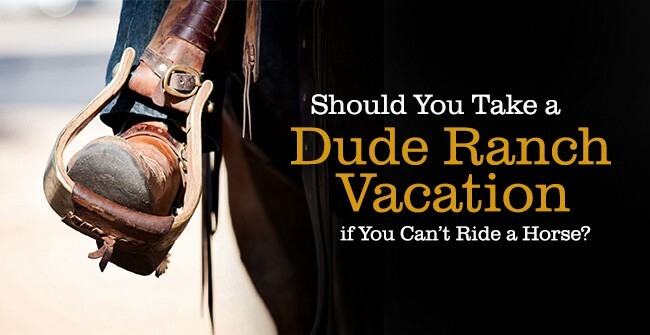 Home » Blog » Family Vacations » Should You Take a Dude Ranch Vacation if You Can’t Ride a Horse? New to horseback riding? No problem. C Lazy U often hears from folks who have never ridden a horse (or are simply not interested), wondering if a ranch vacation is right for them. The answer is yes! C Lazy U loves first-time riders, who often leave the ranch wondering what their next riding adventure will be – or planning their next visit back to the ranch. What makes the ranch such a great first-time environment for horseback riding? Well, there are about as many reasons as there are horseshoes in our stables. Here are a few of the best ones. Around 180 horses call C Lazy U Ranch home. They’re like family to us. Each one has a name, a story, and personality all their own. Buck is wise and gentle, and a real pro with the kids. Betsy is a black and white beauty queen who has carried brides, celebrities, and famous athletes. Brutus is a C Lazy U royal, with the size and the pickiness to prove it! Nobody knows each of our horses better than our head wrangler Bill Fischer and his team, who spend all day with the horses. After a chat and a little eyeing up, Bill will find the horse that has the right energy and personality and who moves at the right pace for you. No wonder so many folks really fall for their horses here at the ranch – there’s a lot of chemistry to it! There’s more to a good horseback excursion than just trotting along a beaten path. We keep things exciting and mix it up depending on the kind of ride you’re after. If you’ve never ridden before, don’t worry, our experienced wranglers and guides will teach you the necessary skills to have fun and be safe and take you on rides that you’ll feel comfortable tackling. Throughout your C Lazy U experience we’ll guide you with plenty of smiles, cheers, and horseback riding tips to help you feel confident and calm in the saddle. By the end of the week you’ll be excited to tag along on a real cattle drive or even showcase your new horsemanship skills in our weekly rodeo (known around these parts as our “shodeo”). At the ranch we subscribe to the notion that riding is part of life, all year round. If summertime riding sounds to dusty and hot, add a horseback ride to a winter visit. A snowy backdrop makes for really magical riding moments, not to mention a chance to ride in a horse-drawn sleigh for those who are saddle-shy. There’s a myth about dude ranches that ranch vacations are all about horseback riding. Yes, horses are at the heart of our ranch culture, but they’re really just the beginning. Although we encourage all guests to try horseback riding at least once in our supportive and safe setting, it’s not for everyone. We know all too well that riders have to want to get up on that horse – there’s no point in forcing it. Luckily, those who opt out will not be bored! During the summer, you can take part in all sorts of fun in the sun, with active pursuits like mountain biking, hiking, and fly fishing, or just chilling out poolside. C Lazy U is a year-around vacation option, so we have plenty of winter activities as well, such as snowtubing, cross-country skiing, ice skating on a Zamboni-groomed pond, and more. And, of course, the Lazy You Spa is open year around! C Lazy U is a unique Colorado vacation for experienced horseback riders, but also for none riders who are excited to try a new activity and release their inner cowboy or cowgirl. So even if you’ve never ridden a horse before, a vacation a C Lazy U Guest Ranch is definitely for you! I am 72 and would love to try this. No experience. Am I dreaming? I am 78. Like you I learned to ride late in life. I was at the CLU more than 10 summers. There are two riding sessions per day. If you take the first three days of two sessions you will love it. One of the most important items for you is that you want to ride. After a few intro rides you will probably want to enjoy some early adventures. One of the best is a bit of climbing and trotting. Your safety is always of paramount importance to the wrangler staff.